My 260th from the 2010 Edition of 1001 Beers You Must Taste Before You Die, 250th from the 2013 edition, and 274th combining both editions. Edit: BB date corrected. This vintage has a three year maximum cellaring recommendation. Yes. The picture is identical for both the bottle and box I have. However, you refer to it as Old Ale. There is nothing on mine that says Old Ale. Is that the possible difference? Bottle #33942. 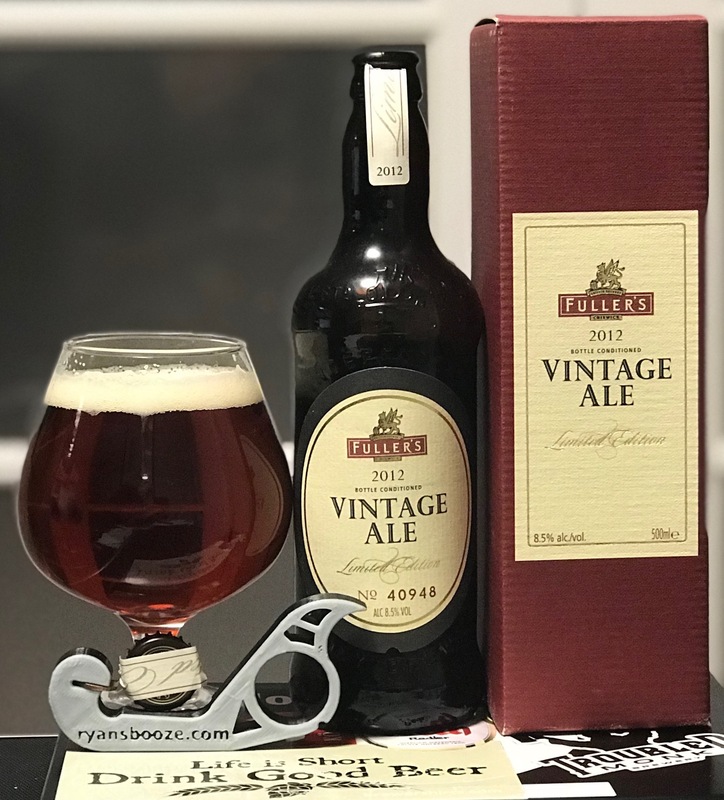 Well, Fuller’s themselves don’t refer to it as an Old, and simply say it’s a strong beer with a new recipe for each vintage. In broad terms, it came down to choosing between “Old Ale” or “Barleywine” for me, and I felt it was more like the former than the latter. (And that’s the classification Beer Advocate went with.) I have no explanation for the BB dates, though – my 2012 and my 2014 both quite clearly gave ten year cellaring recommendations. Where did you buy yours? Could it be different labelling requirements in different jurisdictions? NLC. Pearlgate I think. I bought probably 8 or so at the time and I am down to my last one. It say right on my box they are required to put a best before date on it but states it should improve with age for many more years. Maybe Alan bought it elsewhere? I very much doubt that he got it anywhere other than NLC, but I can ask him. Dunno, man, I’m puzzled. Mine quite clearly gave a 10-year BB, as did my 2014. That’s not something I’d pull out of nowhere, but now I’m regretting not photographing the label / insert. If the missus hasn’t cleared out my recyclables by the time I get home late next week, I’ll do just that. Cheers! Well, I’ll be dipped. Brian, you’re 100% right. This vintage has a BB of “end of 2015”. The 2014 has “end of 2024”. Go figure. All I can figure is I retroactively went back and added the BB dates to my database, read the 2014 and assumed the 2012 was a ten year as well. Ah! I had a thought. I checked the inserts, and discovered the language is different. The 2014 insert says “Being bottle conditioned, it is after bottling that the flavours truly begin to develop and change, and continue to do so throughout the life of the beer.” but the 2012 insert says “Being bottle conditioned, it is after bottling that the flavours truly begin to develop, and continue to do so well beyond the best before date that we are obliged to state.” Looks like there was a regulatory change of some sort in England between 2012 and 2014?